a prize of £25 in the form of an Amazon voucher is awarded each to the 11 other selected calendar entries. Ecoffins is looking for 12 images, one for each month. The images should display one or more animals which are part of the natural British environment. 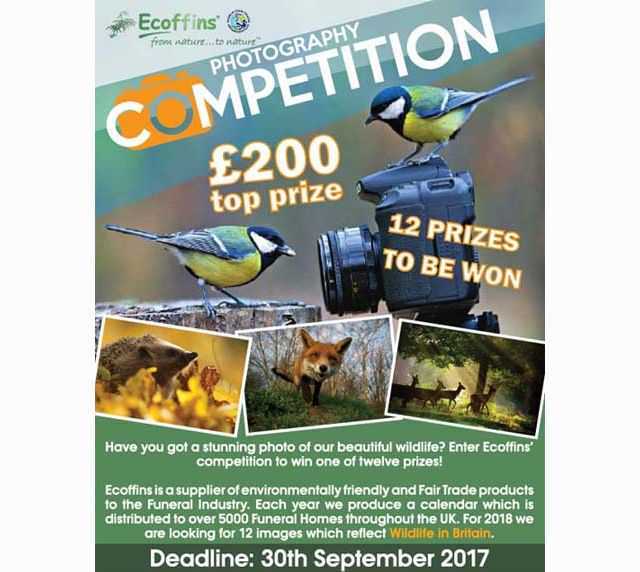 Due to the environment in which this calendar will be used, Ecoffins is looking for images that reflect the beauty of animals and nature in the UK in a positive, memorable and calm way. The winning entrants will be informed by 15th October 2017. Image requirements: JPEG format; no more than 1400 x 1050 pixels and a maximum resolution of 300 dpi. The file size can be between 1 – 4 MB.